Discover Walking’s criteria for evaluating pedometer apps might be very different from your criteria. Some of you enjoy social networking your walks. We are not fans of telling the world where our house is and where we walk every day even though that is a cool feature for many walkers. When deciding which app to choose, know your criteria and read the reviews in iTunes. It will help you narrow your choices. Our first criteria was to choose a free app. Many free pedometer apps encourage you to upgrade for more features and the free app gives you a good intro. One of the other apps required watching a YouTube video to understand its interface. Pedometer Free GPS+ iPhone App is intuitive, easy to navigate and had every feature we needed plus many features we will never use. This iPhone app counts your steps, calories, distance, time and average speed. Also, you can enter your body measurements to track your weight loss progress. You can play and control your iPod tunes within the app which is very convenient. Love this feature. You could use Google’s map to chart your distance manually on each walk but Pedometer Free GPS+ app does it for you automatically. If you want to take off and explore new areas, the app will show you how to return to your starting point. This mapping feature is very helpful when you are exploring a new city on vacation. One of our favorite walking routes is next to a lake. Pedometer Free GPS+ did show us occasionally walking on water which was inaccurate but amusing. However, the mistake was within a very small margin of error. The mileage reported was very accurate and effortless to obtain. We prefer the Omron HJ-112 Pocket Pedometer for counting steps per day since being tethered to an iPhone isn’t our favorite thing. Pedometer Free GPS+ iPhone App was losing hundreds of steps on our walks. The app automatically calculates your stride based on your height but you can override the automatic stride length with your actual stride length. If you have an accurate pedometer like the Omron Pocket Pedometer and know you are losing steps, here is a tip to determine your actual stride length. 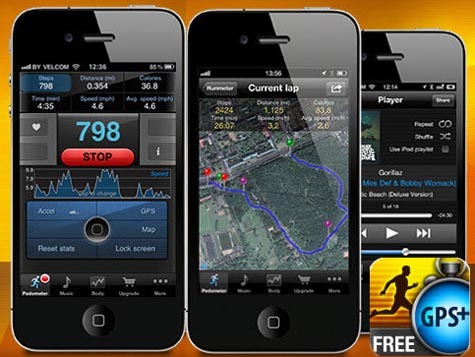 Start the accurate pedometer at the same time the Pedometer Free GPS+ App is started. After walking a couple of miles, note your mileage on your app and the steps on your pedometer. You will be combining the accuracy of the Pedometer Free GPS+ iPhone App with the accuracy of your pedometer using this calculation. This method is better then using the usual calculation for determining your stride length over a short distance. Walking short distances might not be a true reflection of your stride length. You will know your true average stride when you are walking which then can be input into your pocket pedometer and the Pedometer Free GPS+ iPhone App. For us, the biggest plus of any iPhone pedometer app is having gps mapping capabilities to automatically and accurately determine mileage. The one huge negative is that any GPS pedometer app drains your iPhone battery. If we had the app running 100% of the time, the battery drain would be a problem. However, since our purpose is to record distances of our walks and see our mapped path, we give Pedometer Free GPS+ App a big thumbs up. 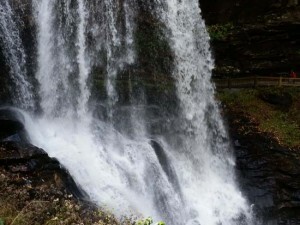 Having this iPhone app will motivate you to walk further and explore new areas. Previous article10,000 Pedometer Steps Equals How Many Miles Distance? I have also used the Pedometer Free GPS+ and it is simply amazing. One of the best pedometer applications available, even better than majority of the paid apps. Nice information is provided through this blog and it is nice to visit this blog and the information provided here. It is an educational blog which increase our information and news. I enjoyed reading, you can be a great writer. I promise I will bookmark the blog and, finally, back then. I want to encourage them to continue their good work. I was looking for a pedometer app for my iOS device but was totally confused what app I should choose as there are so many options available out there. But, now after reading your article, I got an idea. Thanks a lot for sharing this useful information. I’ve just started using the Arawell pedometer on my iphone, and its great. Is there any way to change the distance walked from miles to kilometres?